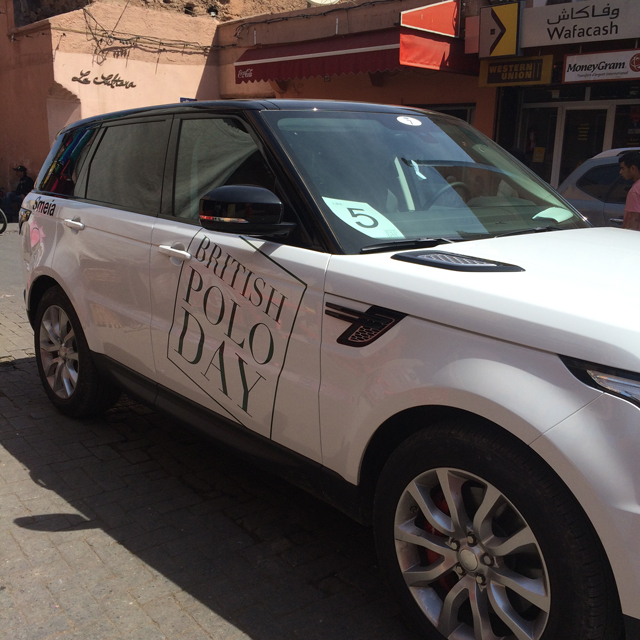 Hetty Chidwick discovers the delights of Marrakech in April whilst visiting for British Polo Day. There are many exquisite little riads in Marrakech, most with sun-dappled inner swimming pools and Hammam spas attached – Riad Farnatchi is a favourite. But if you want a bit of space and more variety with rooms and suites, the larger hotels have more to offer. We stayed in La Sultana Marrakech, which nestles just inside the walls of the old town, a short walk from the main Jemaa El Fna square. This 5 star hot-spot is a hidden oasis, away from the frantic hustle of the souks and street stalls. 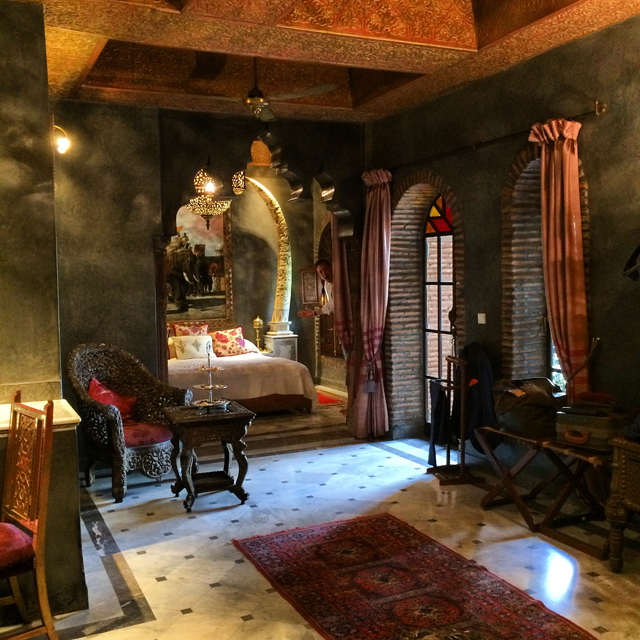 Owned by a French couple, it has an elegant style, which is traditional, grand and Moroccan but with the chic edge for which the French are famed. The Elephant suite is the finest, with a huge bed flanked by large elephant tusks (I was assured these were ancient), an ornate bathroom and a large open plan sitting room with a little inner balcony overlooking the pool. 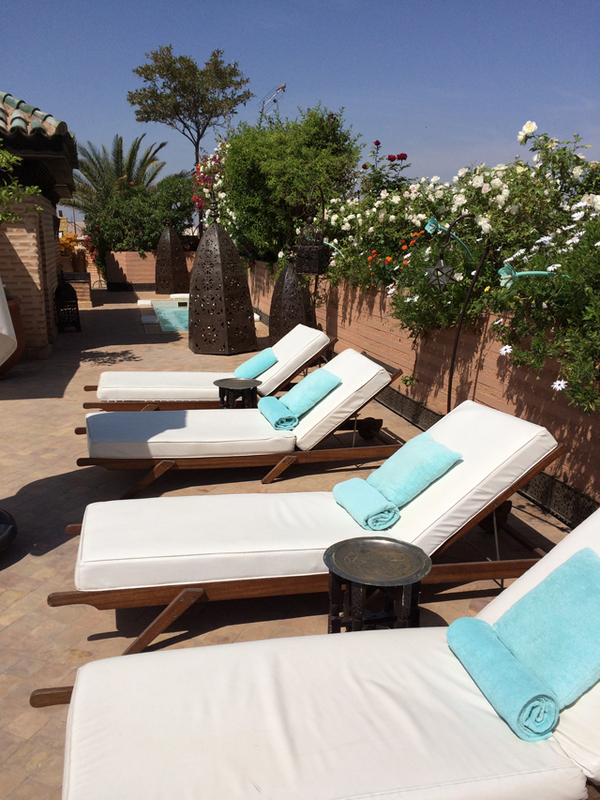 The roof terrace – where we spent most of our time. Breakfast, lunch and lantern-lit dinner are served here and you over look the city to the majestic, snow capped Atlas Mountains. There are also sun beds and an essential little plunge pool. Try a Morroccan tasting menu which means you sample a variety of the local cuisine including traditional Harira soup with dates, tagines of cous cous and vegetables, juicy monkfish and prawns and tender braised beef with almonds. The small tasting portions means you save space for the homemade ice creams which are not to be missed. Help yourself to the pre made virgin Mojito mix on the sun bathing terrace, prop your handbag on one of the miniature chairs proffered by the waiters in the restaurant and keep cool with little complimentary sorbet tasters brought to your sun beds.  The service was faultless and the magic staff seemed to know what we wanted at all times, often before we realised ourselves. Some of Sir Richard Branson’s family were staying at La Sultana for British Polo Day, a wonderful and eclectic event that showcases and celebrates British brands, as well as some fine polo, across the globe. It’s second visit to Marrakech; we joined for Friday night’s soiree at El Fenn owned by Vanessa Branson (Richard’s sister), for a pre party with champagne, fire throwing, a vast Moroccan buffet and dancing. The following day held exciting polo at Jnan Amar Polo Club and a Gala dinner for the benefit of the Eve Branson Foundation. Finally on Sunday there was a chilled brunch held at the Capaldi – guests were chauffeured elegantly in brand shiny new Land Rovers to and from all the events.